Live Tweet topics for 8 October 2013 that starts at 1230 (12:30 PM) Perth time. Shilbury et al (2009) suggest that there are four levels of a product (core, facilitating, supporting, and augmented product), which help consumers to satisfy a need or want through consumption (for example, buying season tickets to one’s favourite team). In our online lecture, we will discuss only supporting products that can add value to the core product and aid to differentiate it from competitors (i.e. membership benefits to season members, access to special events, discounted team merchandise, and many others). Distinguished sport marketer Lawrence Wenner (1989) noted that “If the broadcasters [or sport marketers] have done their job well, the sports fan will be attentively viewing when a commercial message appears” (p. 15), which formed part of our discussion in week 7 on sport media and marketing. During our discussion on television, we discussed the ever-increasing avoidance of commercials (during ad breaks) through zapping, online streaming, and digital video recorders. In our online lecture, we will discuss how contemporary media embed marketing messages into the coverage of sporting events to ensure that a sport fan is “attentively viewing” the marketing message when it appears on screen. “Sell” stories to attract viewers or readers to make money. This post is a copy/paste of an accepted 20-minute presentation that I co-authored with Katherine Bruffy of Unitec and Michael Naylor or AUT that will be presented at the 2013 SMAANZ conference in Dunedin, New Zealand. Social media has transformed the way in which sport organisations and consumers can connect. Historically, communication between sport organisation and consumer has been through the traditional/mass media (e.g., newspaper, television) which situates media organizations as gatekeepers to, and editors of content (Arsenault & Castells, 2008). Further, communication has typically been one-way, thereby disconnecting the consumer from sport organisations (Mahan & McDaniel, 2006). With the proliferation of social media sites, consumers and sport organisations have a new platform for interaction. Both iterative communication and gatekeeper bypass are possible (Mean, Kassing, & Sanderson, 2010). Social media is therefore an increasingly important tool for sport organizations to communicate with various stakeholders (Scott, Bradshaw, & Larkin, 2013) and the fit of social media within wider strategic processes in sport is of interest. Various social media sites are now widely used to communicate promotional offers, news, and as a public relations tool (Hambrick, 2010; Lowe & Laffey, 2011). While Instagram, Youtube and other social media sites are gaining traction, Facebook and Twitter remain the focus for most sport organizations in attempts to engage fans. The four stages sit within a mixed method, action research framework in which the implementation and evaluation of the strategy are the result of collaboration between the research team and the sport organisation. The project has been designed to explore, inform and evaluate the NZB’s social media strategies. The social media of interest are Twitter and Facebook. Stage one (June/July 2013) is a reconnaissance intended to synthesise past NZB social media activity, the activity of other sport organisations in New Zealand and around the world as well as relevant scholarly and practitioner literature. During stage two (August, 2013), the reconnaissance stage findings will be used to inform the 2013-2014 season strategy. For the duration of the season (stage three; October to April 2014) the strategy will be implemented and monitored. Finally, the fourth stage (May, 2014) represents an evaluation in which data will be gathered from fans, sponsors and Breakers marketing staff through a questionnaire and interviews. The focus at this stage will be evaluating the effectiveness of the strategy implementation. We propose to review stage one and two as well as progress to date through stage three at the 2013 SMAANZ conference. 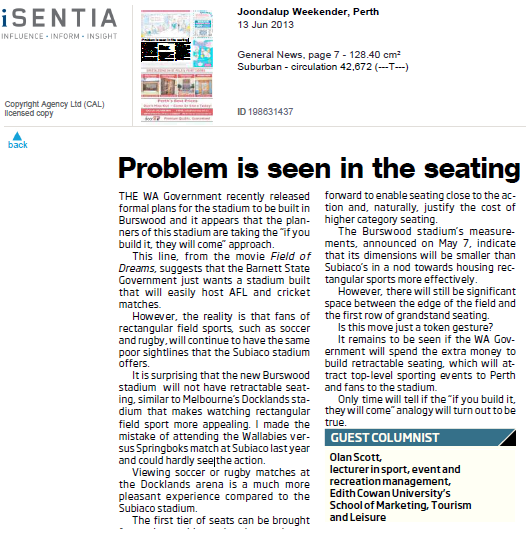 This is a copy/paste of an article I wrote for the Joondalup Weekender newspaper that was published on 13 June 2013. THE WA Government recently released formal plans for the stadium to be built in Burswood and it appears that the planners of this stadium are taking the “if you build it, they will come” approach. This line, from the movie Field of Dreams, suggests that the Barnett State Government just wants a stadium built that will easily host AFL and cricket matches. However, the reality is that fans of rectangular field sports, such as soccer and rugby, will continue to have the same poor sightlines that the Subiaco stadium offers. It is surprising that the new Burswood stadium will not have retractable seating, similar to Melbourne’s Docklands stadium that makes watching rectangular field sport more appealing. I made the mistake of attending the Wallabies versus Springboks match at Subiaco last year and could hardly see the action. Viewing soccer or rugby matches at the Docklands arena is a much more pleasant experience compared to the Subiaco stadium. The first tier of seats can be brought forward to enable seating close to the action and, naturally, justify the cost of higher category seating. The Burswood stadium’s measurements, announced on May 7, indicate that its dimensions will be smaller than Subiaco’s in a nod towards housing rectangular sports more effectively. However, there will still be significant space between the edge of the field and the first row of grandstand seating. Is this move just a token gesture? It remains to be seen if the WA Government will spend the extra money to build retractable seating, which will attract top-level sporting events to Perth and fans to the stadium. Only time will tell if the “if you build it, they will come” analogy will turn out to be true.